Highland Tank provides the strongest and most reliable oil/water separators in the industry. Our separators are designed to remove oil, grease, light petroleum products, and oily-coated solids from a variety of wastewater discharges to comply with EPA discharge regulations. They are typically installed in industrial areas and receive oily wastewater generated during processes such as bulk petroleum storage and handling, aircraft and vehicle fueling, maintenance and washing, and environmental remediation of petroleum-contaminated sites. 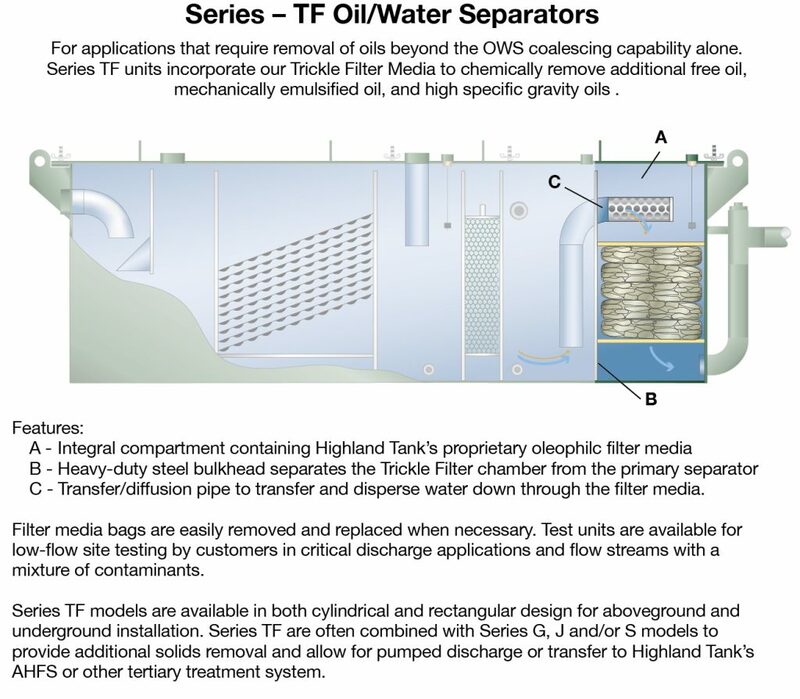 All HTC separators are constructed to UL® specifications and include Highland Tank’s patented Corella® technology with secondary Petro Screen coalescers to provide effluent quality down to 10 PPM or less of free oil. UL® SU2215 labeled units are also available with approved coatings and high oil alarm system. Highland Tank Oil/Water Separators are listed under one or more patents and approvals. Please see product literature for details. Our Model HTC separators are available in a wide range of standard capacities in either single-wall or double-wall construction. We’ll also custom fabricate an oil/water separator to satisfy your specific needs. All Highland separators are equipped with our non-clogging Corella® coalescer to accelerate the separation process and greatly reduce the level of oil and oily-coated solids discharged into municipal storm or sanitary sewers. Cylindrical separators are available for aboveground or underground installation. Our rectangular Separators are designed for aboveground or vaulted underground applications. Highland Tank’s underground cylindrical oil/water separators are designed for gravity flow operations. Installed at a wide range of large industrial applications, they are unmatched at treating wastewater under a wide range of conditions with flow rates up to 6,000 GPM. With our EZ-Access option, they permit unconfined access for inspection and maintenance from above. For additional options that may benefit or be required for your oil/water separator, please complete our Design Questionnaire. Click here for Underground Cylindrical Oil/Water Separators User’s Manual. 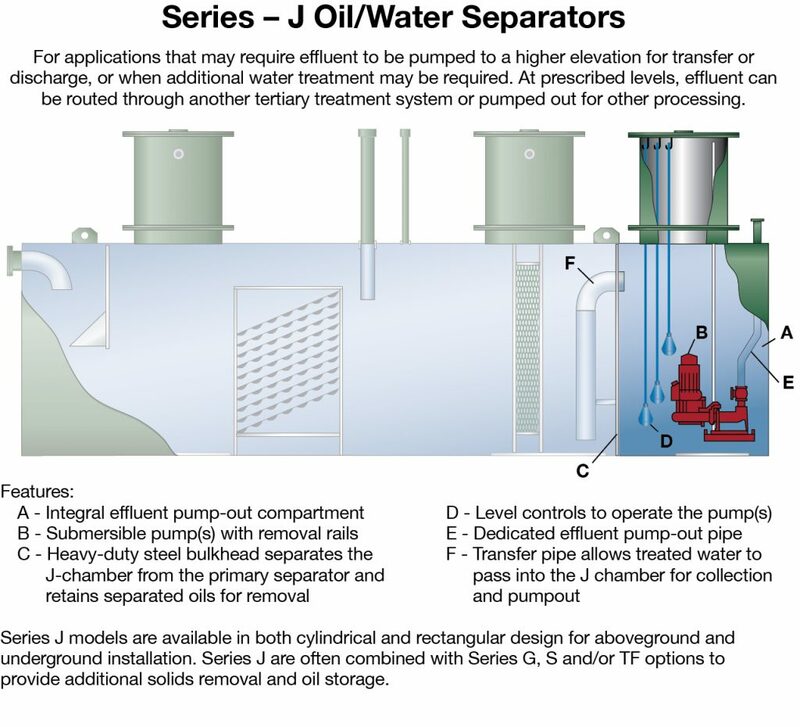 Rectangular oil/water separators can be installed aboveground or in an underground vault usually in applications when influent or effluent may need to be pumped. 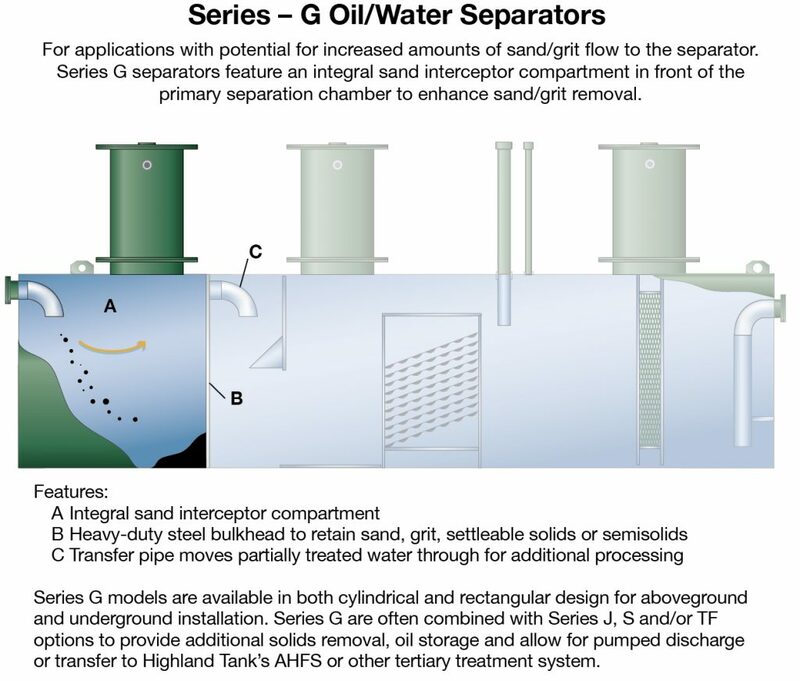 Effective removal of free-floating oil, grease and settleable oily coated solids from oil/water discharges at rates up to 2,500 GPM, make Highland Tank’s Oil/Water Separators second-to-none in design, quality, and workmanship. 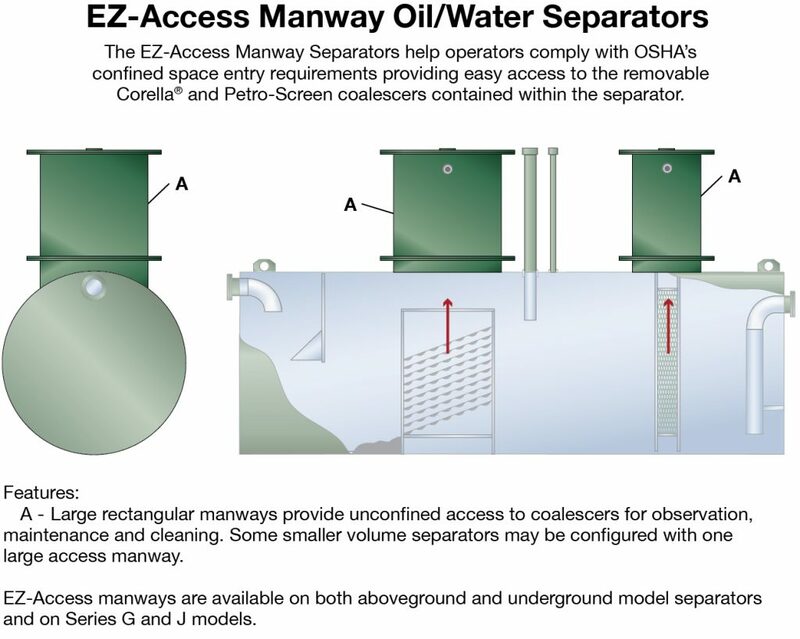 Click here for Aboveground Rectangular Oil/Water Separators User’s Manual. 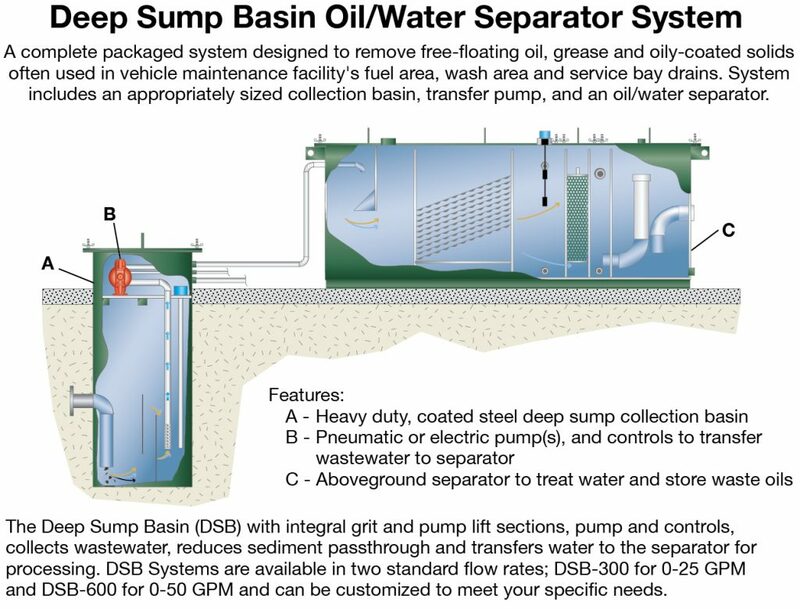 The Deep Sump Basin (DSB) is a complete packaged system consisting of the DSB with Integral Grit and Pump Lift Chambers, Influent Pump Package, and Model R-HTC Rectangular Aboveground Oil/Water Separator. Designed to remove free-floating oil, grease and settleable oily-coated solids from a vehicle maintenance facility’s fuel area, wash area and service bay drains, they are installed in vehicle repair and service facilities, car and truck dealerships and fast lube shops to help prevent discharges of harmful pollutants into the storm or sanitary sewer system. Highland Tank’s standard DSB Systems feature flow rates from 25 to 200 gal./min. 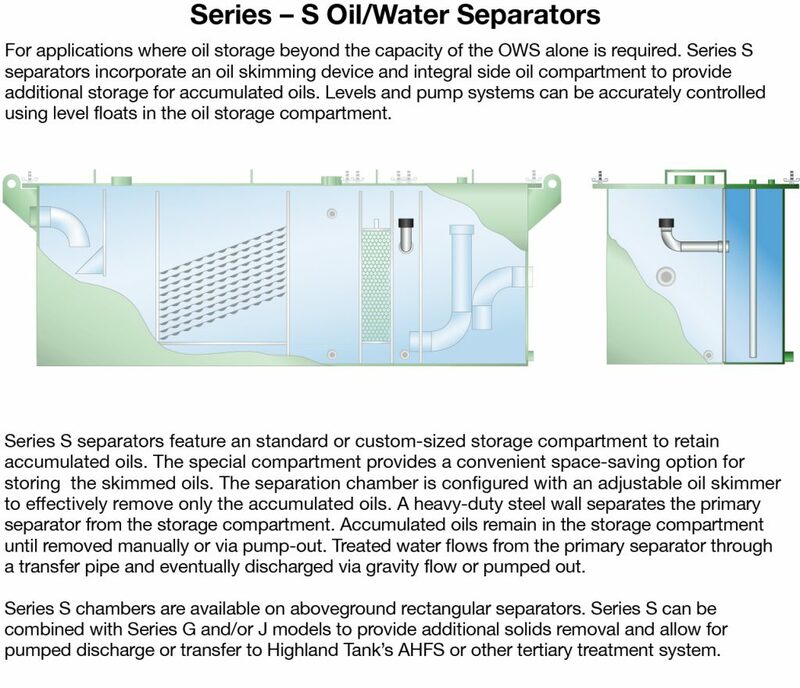 OilStopper® Oil/Water Separators incorporate Highland Tank’s patented Corella® coalescer that combines both flat and corrugated plate technology into a new “self-cleaning” design. Additionally, the OilStopper® includes our proprietary Diskimmer, a completely integrated, electrically powered oil recovery device. The unique ability of stainless steel to resist corrosion, heat damage and chemical damage, our high strength separators will increase the life of your project while providing the best value in the long run. Cylindrical separators can be installed aboveground when higher flow rates are required, and underground installation is not feasible. Designed to accept gravity or pumped influent, they help industries comply with oil and grease discharge regulations. Like our cylindrical underground units, they are available with flow rates up to 6,000 GPM.